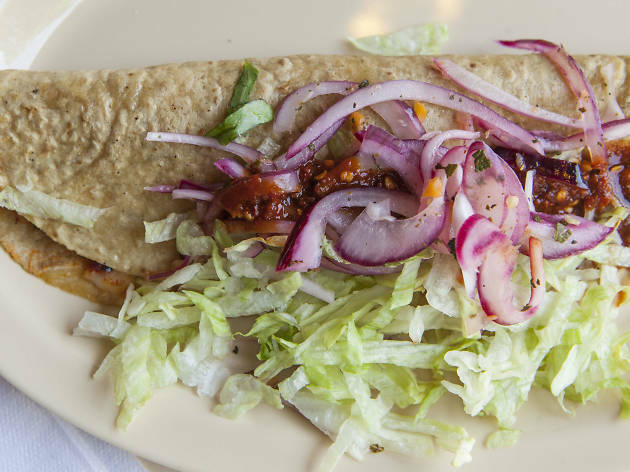 Tucked in the back of La Catedral Cafe & Restaurant is Las Quecas, the only Chicago outpost of the quesadilla chain (there are also locations in Carpentersville and Melrose Park). The tortillas are made right in front of you and it shows—they're thick, fresh and perfect vessels for fillings that range from carne asada to squash blossom. Chicharrons are tender and cloaked with a vibrant salsa roja that ofers a slow burn, while a spin through the salsa bar reveals some excellent, piquant sauces. Best quesadillas I've try in Chicago!!! Its a must if you are in the area. Even if you are not! The drive is for sure worth!!! Work often brings me by the Melrose Park location and I eat there whenever I'm around at lunchtime. The tortillas are so deliciously fresh and tasty I wish I could eat two. Forget it though, they're too big. I like the whole wheat tortillas with mushrooms and onions on mine but I'm willing to try the chicarones next time. 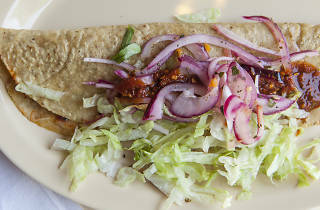 The people are so nice and yeah, the salsas are made with fresh vegetables and very rich in authentic flavors. They are what they are and you get what you pay for it definitely five stars.